44 / the tasting panel / july 2014 A LONE STAR LIFE by Anthony Head / photo by Kirk Weddle G reat wine is great wine, regardless of what's on the label. We can all agree on that, right? Well, actually, for Dallas wine writer Andrew Chalk, that dog don't hunt. Some Texas labels, he claims, disguise whether the wine inside is mostly or entirely produced from out-of-state grapes. To be clear, he's not against the practice of importing juice and grapes into Texas to be finished and bottled, but he believes said bottles should be labeled accurately and transparently. It's mostly a federal issue, so good luck with that one. However, there is a marketing program from the Texas Department of Agriculture (TDA) called "Go Texan," created to promote comestibles and other products made in Texas. Until now, a bottle of wine could have zero percent of the grapes come from Texas and still wear the "Go Texan" logo on the label as long as some level of production was carried out in-state. This, too, didn't sit right with Chalk. "Wine is determined by the origin of the grapes. You can't produce 'Texas wines' with grapes from California," Chalk told me recently. "It comes down to terroir, and with wine, terroir is absolutely essential to the character." At first, it seemed a quixotic mission as Chalk waged his one-man campaign to abolish the zero percent rule for Texas wines (which are, in the TDA's own words, a "$1.8 billion contribution to the Lone Star State's econ- omy"). Through Chalk's dogged efforts, though, the TDA put the request through two rounds of public comments on just how much Texas grapes should be in "Go Texan" wines. In June, the TDA announced a new rule, setting the minimum at 75-percent to be eligible for the "Go Texan" mark. The rule is currently undergoing another comment period; anything up from 0 is an accomplish- ment, but 75 percent is at least a nod of respect for Texas grape-growers, who were under the impression all along that they were a key component for making Texas wines. Chalk has received some harsh words from his critics, including some winemakers, but he remains unfazed. After all, he's the one who moved the needle for Texas terroir. 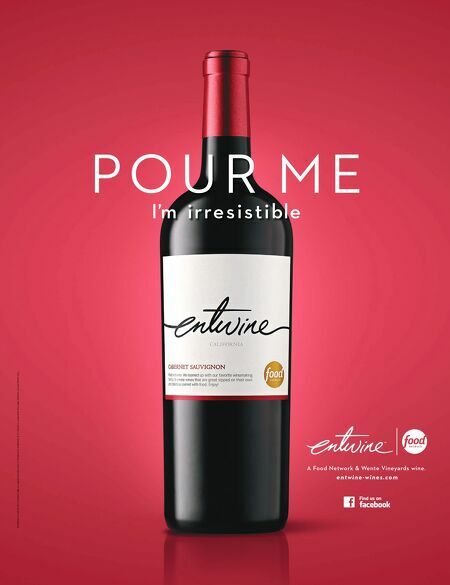 "It's a truth in advertising campaign for some- thing I'm passionate about. I'm deeply impressed by what's been done in the Texas wine industry. Texas wines are winning more and more medals—not just in Texas, but in Lyon, San Francisco and San Diego. It's no freak occurrence, either, but a regular result whenever Texas winemakers submit their best Texas wines." 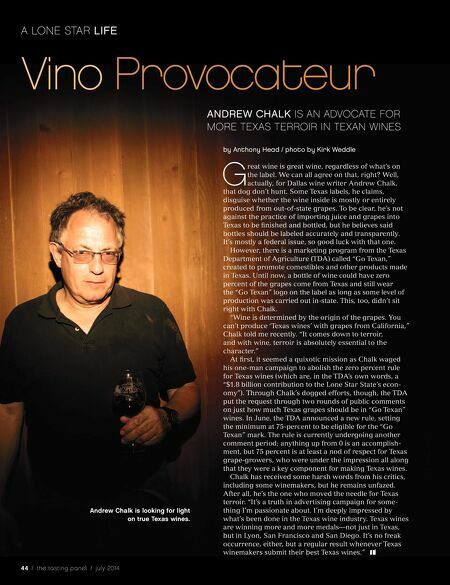 Vino Provocateur ANDREW CHALK IS AN ADVOCATE FOR MORE TEXAS TERROIR IN TEXAN WINES Andrew Chalk is looking for light on true Texas wines.